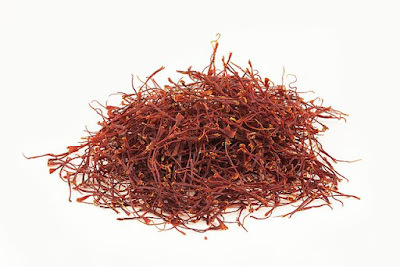 Saffron is a highly expensive spice that is used to flavour and color food. 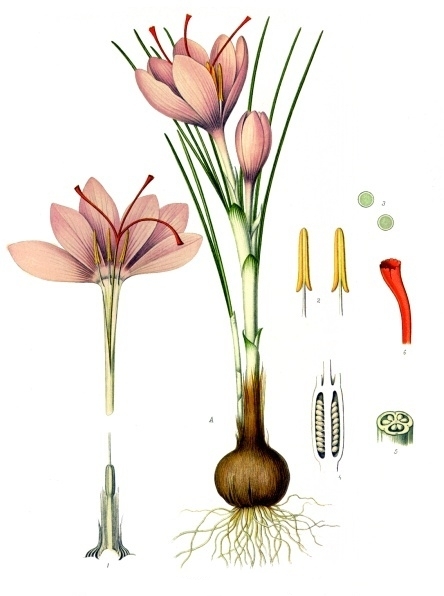 The spice is actually the dried stigma - tiny thread-like strands - of the Crocus sativus linnaeus, a member of the iris family. Each stigma is very small, and tens of thousands of individual strands go into a single ounce of the spice. Since the stigmas are hand-plucked from the individual flowers, saffron's high cost becomes more understandable. In fact saffron is the most expensive spice in the world! Saffron originated in the middle east, but is now also associated with Greek, Indian and Spanish cuisines. The flavor is distinctive and pungent and fortunately, a very little saffron goes a long way as it can added one thread at a time. In fact you only need a thread or two to flavor and color an entire pot of rice! If you are growing your own, harvesting saffron involves keeping an eye out for the three red stigmas that occur in each bloom. These should be harvested in the morning when the flowers have fully opened. 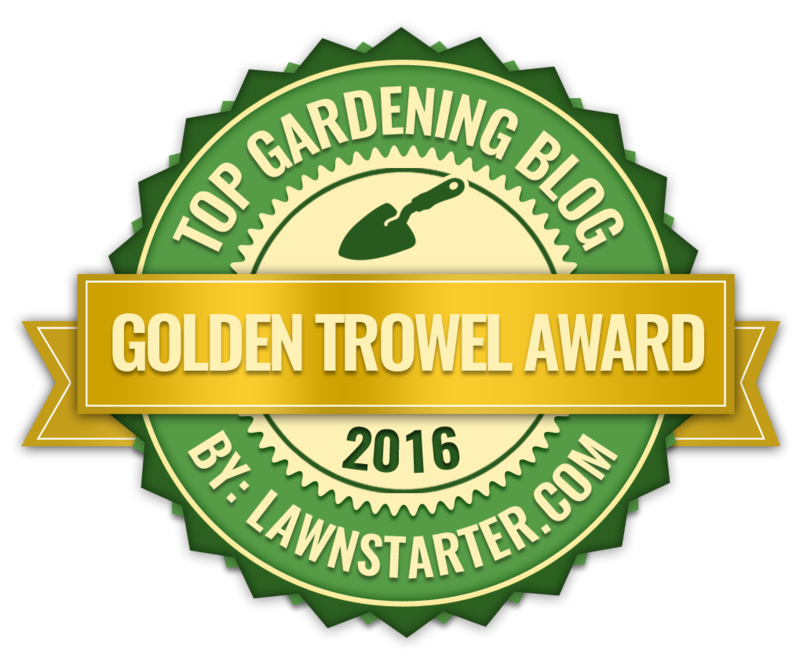 Carefully remove them from the flower with tweezers and dry them off in a warm dark location. To avoid spoiling your crop, give your saffron plenty of time to dry out and store it in a dark, tightly capped container. Several saffron cultivars are grown worldwide but for those who want the best quality spice only a few of them are known to be of a “premium" quality. 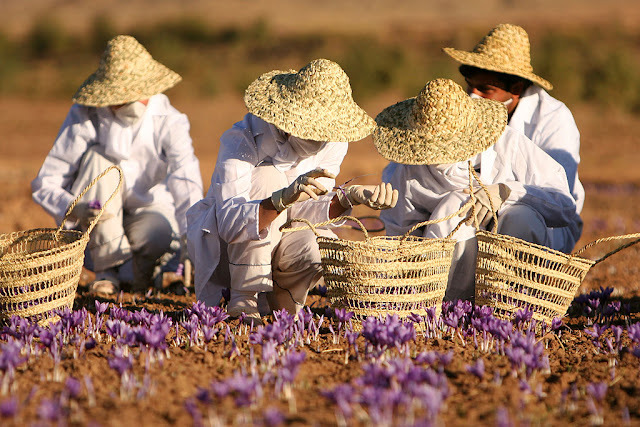 The "Aquila" saffron is perhaps the best known, grown exclusively on eight hectares in the Navelli Valley of Italy's Abruzzo region. Another is the Kashmiri "Mogra" or "Lacha" saffron (Crocus sativus 'Cashmiriana'), unfortunately it is almost impossible to obtain such coveted and valuable plants. However you should still be interested in obtaining Saffron crocus they should be available as bulbs in your local plant retailer as soon as the autumn bulb displays arrive. "Donning the saffron robes" is a poetic way of saying 'becoming a Buddhist monk'. The followers of the Buddha selected the colour saffron as the official colour of his priesthood shortly after his death, and the bright golden yellow robes have been the distinctive mark of the Buddhist monk ever since. Saffron is widely used in Ayurvedic medicine, India's traditional system of health that relies on natural products, prevention and balance. It is used in remedies for everything from arthritis and asthma to infertility and impotence. Ancient Egyptians used saffron to treat kidney problems, and there are now research results that might suggest that one of the ingredients in saffron lowers - or assists in lowering - high cholesterol. There are even suggestions that saffron may have been used against cancer in the middle ages, although with what success is unknown.